The Equarius Hotel offers luxurious accommodations as well as meeting rooms, a banquet hall, and a celebrity chef restaurant. The modern architecture is the creation of award-winning American architectural firm Michael Graves & Associates, who also designed the Beach Villas. Inside, the hotel’s natural theme is immediately apparent from the live plants, earth tones, and striking waterfall display in hotel lobby. Equarius Hotel’s 172 guestrooms are divided into three categories: Deluxe Rooms, Deluxe Garden Rooms, and Deluxe Suites. 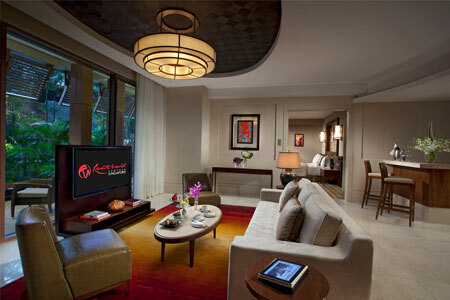 Deluxe Rooms measure roughly 51 square meters, making them among the largest rooms of this category in Singapore. 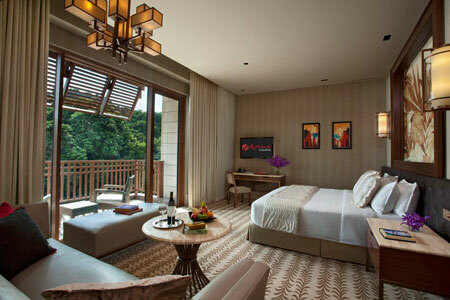 Rooms are furnished with your choice of one king or two twin beds with 400-thread count linens, work desk, sofa, fully stocked mini-bar, kettle with premium TWG teas and coffee, and private balcony overlooking the lush rainforest. 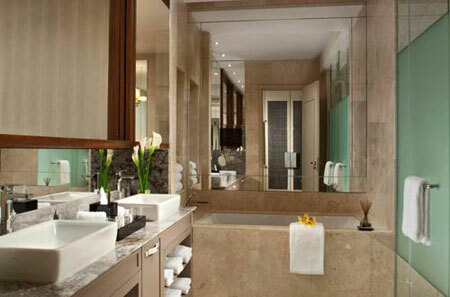 The bathrooms are done in marble and feature double sinks, separate shower and bathtub, and ESPSA spa products. All the modern amenities are provided including an LCD TV with international channels, electronic safe, iPod dock, and broadband internet access so you’re always connected. If you plan to spend your holiday swimming and sunbathing, consider an upgrade to one of the Deluxe Garden Rooms or Suites which offer a large patio with personal sun loungers and direct access into the free-form swimming pool. The six Suites are more than double the size of the Deluxe Rooms, and have a spacious living room, dining table, and a bar that make them ideal for entertaining guests. In addition, Suites offer a wine fridge and Nespresso maker and guests staying in Suites enjoy privileges like 24-hour butler service. Equarius Hotel offers its own outdoor swimming pool and fitness centre, but hotel guests have access to the recreation facilities at all of the Resorts World Sentosa hotels. 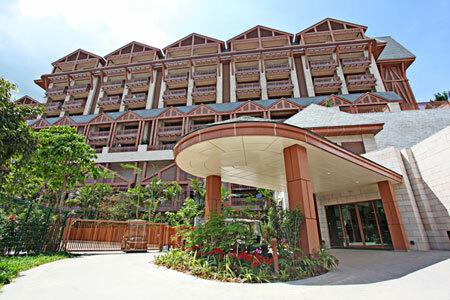 The hotel is also home to Forest, a unique glass-house restaurant by celebrity chef Sam Leong offering Chinese-Thai cuisine.